What new technology is currently being used professionally that we aren’t teaching? Should we update our curriculum to reflect recent changes? How do we obtain enough knowledge about the new technology so we can teach it? How can we predict what technology WILL be used in the future? Unfortunately, this challenge is even harder than it appears. Technology has been advancing EXPONENTIALLY. The amount of progress made in the last 100 years will happen MUCH MUCH faster in the future. This makes it impossible to predict what the future will be like. The human brain is simply not wired to think this way. In 1985 could you really have guessed what our world would be like today? For a more in-depth read on this topic, check out this article from one of our favorite writers. Because of this exponential progress, younger people are far more comfortable with newer technology. Anyone born after 1990 (read: all students today) know no world in which the internet, mobile devices, and cloud computing did not exist. Most teachers today did not grow up in the same technological generation and therefore had to adapt to these new concepts. Students don’t think about mobility, interconnectedness, or unlimited access to information as something new or more advanced than what came before. To them, it just IS. In education, technology is not something that can be separated from a topic (or any part of the teaching process). It must be “taken for granted” in the same way students take it. Technology must be integrated into the fundamental foundations of the topic. From the perspective of students, separating technology from topic only highlights the disconnect between what is being taught and how the world actually operates. Academic systems are naturally behind technologically – and rightfully so. Faculty must observe the current world and make decisions about how to best prepare students for it. Making those decisions takes time. If technology were advancing linearly, education would stay a certain distance behind the professional world. But with the acceleration of progress, universities are falling farther and farther behind. 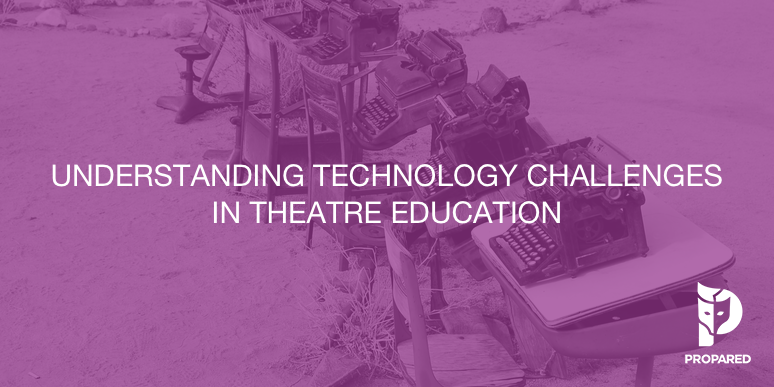 When it comes to live events and theatre education, we are in the same boat as our academic compatriots. We’ve seen huge technological advancements in our field: lights, consoles, microphones, automation, CAD programs, drones, etc. In some areas we have been quick to adapt, and others we have been slower. Pressure to Catch Up. Where Does it Come From? Students: Students are worried (and rightfully so) about having the skills needed to compete in the working landscape. They grew up with this technology and expect it to be a part of their lives. Employers: Employers in the work world need employees with training and experience in their processes. Other Institutions: Institutions are vying for the same students. Standing out from other programs is critical to recruiting the best and brightest. Educators: Educators know that curriculum must evolve. They use technology in their professional lives or see it being used by colleagues. They feel the brunt of the pressure from students as well. With new technology creating rapidly accelerating changes in the work world, it’s becoming harder and harder to adequately prepare students for their future as professionals. Understanding: In order to teach a new technology educators have to understand how to use the technology themselves. Creating curriculum takes a ton of time, especially when the concept is one that you are not innately familiar with. Time is something that educators simply do not have, especially when institutions are short staffed and the demand on educators includes huge duties outside of classroom time. If it’s not broken, why fix it? “It’s how it’s always been taught.” Teach what you know. If an educator was taught a certain way, or had a specific process in their professional career it can be difficult to accept that better ways have been invented since. It is a fundamental instinct of educators. Take what worked for you professionally, and apply it to your job. Financial: With such rapid change, keeping up with the new is expensive, and budgets are tight. Requirements: Every student will need access to the technology. Do institutions provide technology? Is it a prerequisite? What if students can’t afford it? This challenge increases as technology grows more expensive. The desire to keep education affordable to students often creates an unfriendly environment for new technology. Fortune-telling: How do you know that THIS technology will around long enough to be relevant for your students when they enter the work world? Often, we don’t make changes until we are forced to. Forcing change is rarely pretty. With change coming more and more quickly every day, we need to find ways to get out ahead of the curve. We’ve written before about how to effect change in an organization. Education presents even more challenges, so what can we do? Students, Professionals, and Educators, bring different perspectives, different knowledge, and different opinions – but each are vital to the process. Because educators are at the cross-roads between students and the professional world, they must spear-head tighter collaboration between all of us, and find more opportunities to bring us all together. It’s what makes organizations like USITT, SETC, and others, so important. In order for us to empower and inspire the next generation, we need teachers to drive major changes that speak better to the evolving landscape. And we need academic and financial support for those teachers from their schools. The time is right for a new approach.